UPDATED: Wed., Nov. 29, 2017, 9:38 p.m.
TEGUCIGALPA, Honduras – Officials late Wednesday again delayed the announcement of final returns from Honduras’ presidential election, while the main opposition candidate vowed not to recognize the official count after the latest partial results edged incumbent President Juan Orlando Hernandez into a razor-thin lead. After leading by about 5 percentage points in initial results announced early Monday, opposition candidate Salvador Nasralla had 42.11 percent of the votes Wednesday night, barely behind 42.21 percent for Hernandez, according to the latest returns on the electoral court’s website. Public updates of the vote count essentially stopped for over a day after the initial report, then resumed in a trickle of returns. A slow but inexorable evaporation of Nasralla’s lead raised tensions in the country and fed suspicions among his supporters that the count was being manipulated. David Matamoros, president of the electoral court, acknowledged the computer outage but insisted there was no problem with the vote count from Sunday’s election. “There was a failure in the court’s computing system, but not critical, and it is now functioning properly,” he said in an interview with Channel 3. Hernandez, whose supporters already claimed victory on his behalf, called on all parties to be patient and await the official result “with calm and in peace.” He also committed to respecting the result. 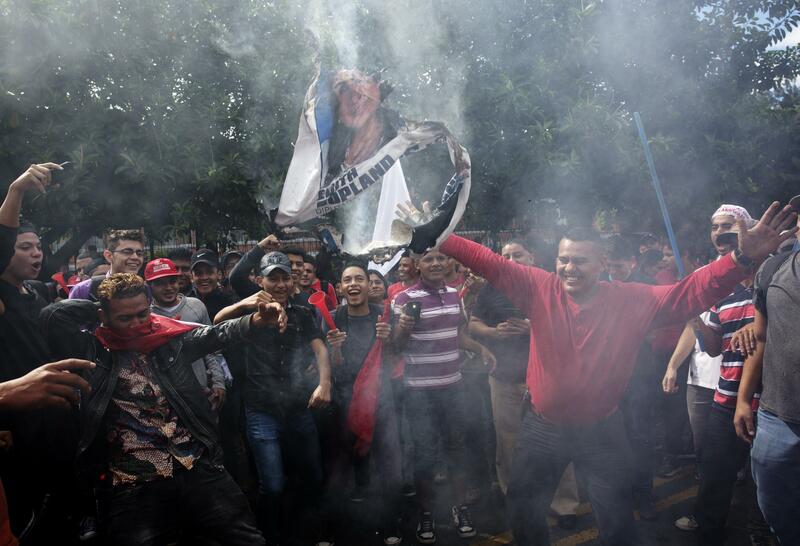 The challenger later said his political alliance would block roads in Honduras’ main cities. Several roadblocks were quickly reported on several highways. Karo Avila, a college student studying journalism, was among them. “I am from the National Party and I’m ashamed by what is happening because I see how some lend themselves to the whims of those who don’t want to let go of the government,” Avila said. Supporters of the governing National Party also held “victory caravans,” waving blue- and white-starred flags from automobiles. Nasralla and supporters of the opposition alliance are sensitive to any whiff of election shenanigans. It was Hernandez’s National Party that orchestrated the coup that removed President Manuel Zelaya from office in 2009. Published: Nov. 29, 2017, 10:51 a.m. Updated: Nov. 29, 2017, 9:38 p.m.